1100 hrs. to 1430 hrs. 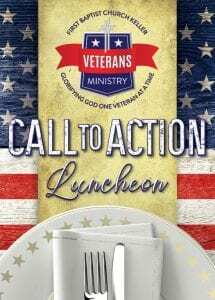 Veterans, active service, and military reserve are all invited to come together for Christian fellowship, camaraderie, and support of one another. Our keynote speaker, Retired Captain and Green Beret, John Arroyo, will share his amazing story of survival and faith while on post at Ft. Hood, TX, on April 2, 2014. Please bring your memorabilia to display during the luncheon. We will have tables set up at 10:00 a.m. where you can place your memorabilia. Please let us know if you would like table space for your display when you sign up for the luncheon. Sign-up will be available from February 24 through March 24 across from the Worship Center. Contact John Welch at tx.blackhorse@gmail.com for more information.